I love blues and I love pastels! I have a fair number of pastel blues in my collection so I thought I'd do a comparison. Too bad you can't really see the shimmer effect! Oh Tiff! is a true Tiffany blue, kind of a pastel blue-green or aqua. In fact, I put my thumb against a Tiffany box and it really looks like the exact shade to me, although the lighting here isn't that great right now. There's some kind of secret shimmer in it but it's pretty much impossible to see, even in the sun. I've mentioned this one in a previous post already but the application is good. A tiny bit streaky, but in two coats it was perfect. Tranquility is bluer than Oh Tiff!, closer to a robin's egg blue but still a bit greenish compared to Cattitude. Application was similar to OT, but better. Two coats in the picture. What's With The Cattitude? is a true robin's egg blue. This one is more of a jelly than a cream, I'd say. It was more sheer than the others (except Dive Deeper) and a bit more watery. Two coats was fine for me, though. Take Me To Your Chateau is my favorite of the five right now, I think. 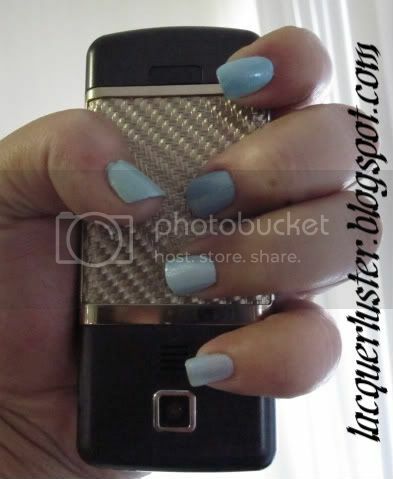 It's a stark, mod pale blue with absolutely no shimmer or anything. I've been looking for something like this for a while, something similar to Hard Candy Sky, and I think this is it! Application on this one was perfect! I actually only used one coat of this one, and it dried very quickly. The finish was almost satin, so it definitely could use a top coat, although I did apply all of these alone without base or top coat. Dive Deeper is a sheer, pearlescent pale blue with iridescent microglitter. I was excited to try it because it's so pretty in the bottle, but I was really disappointed. I used two coats in the picture but it could have used a third (nail line was still visible). Also, it never dried! I did put it on my pinky so maybe I painted it on a bit thick, but even when I put on a thin coat over the other colors it took quite a while. Very similar, no? It's kind of hard to compare because the box is textured while the nail polish is glossy. Oh Tiff! dries darker on the nail than it shows in the bottle. I believe China Glaze For Audrey is similar but a bit darker.